XSEED Games are very happy with the sales of their life sim and farming RPG titles. STORY OF SEASONS has now sold more than 100,000 units in NA since it released on March 31, 2015, and Rune Factory 4 has sold over 160,000 units in NA since its release in October of 2013. Be sure to check out our reviews of STORY OF SEASONS and Rune Factory 4. Also, check out our E3 impressions of Return to PopoloCrois: A STORY OF SEASONS Fairytale. Torrance, Calif. – July 15, 2015 – XSEED Games, the independent-minded console publishing brand of Marvelous USA, Inc., today announced that its life simulation and farming RPG, STORY OF SEASONS, exclusive to the Nintendo 3DS™ hand-held system, has sold more than 100,000 units to date in North America since its release on March 31, 2015. Produced by creative mastermind Yoshifumi Hashimoto, this latest iteration in the 18-years-running series known in Japan as Bokujo Monogatari is XSEED Games’ fastest-selling title ever, reaching the 100,000 unit milestone even faster than the Hashimoto-produced Nintendo 3DS title Rune Factory 4, which has sold over 160,000 units in North America since its release in October 2013. Set for release this winter exclusively for Nintendo 3DS, Return to PopoloCrois: A STORY OF SEASONS Fairytalemarries the world of PopoloCrois to the theme of STORY OF SEASONS with an emotional narrative that both veterans and newcomers alike can enjoy. Featuring classically-styled turn-based combat alongside ample farming and life simulation elements, players can collect over 600 items and undertake nearly 100 quests throughout this comprehensive crossover, supplementing its 25+ hour main story with nearly unlimited potential for replayability. A new game based on the Japanese PopoloCrois Story comic book series, and a new entry in the wildly successfulBokujo Monogatari farming and life simulation series now known as STORY OF SEASONS in the West, Return to PopoloCrois: A STORY OF SEASONS Fairytale features both classically-styled turn-based combat and towns full of lively and interesting NPCs who contribute to a heartwarming narrative about friendship, forgiveness, and the bounty of the earth that veterans and newcomers alike to either franchise can enjoy equally. Ample farming and life simulation elements are also on offer in this comprehensive crossover, including real-time crop-raising, bug-catching, rock-quarrying, item synthesis, and relationship forging. Players can collect over 600 items and undertake nearly 100 quests throughout the game, supplementing its 25+ hour main story with nearly unlimited potential for replayability. StreetPass™ features are also present, allowing players to connect with one another and earn bonus items through treasure-hunting. STORY OF SEASONS carries on the iconic life simulation and farming RPG gameplay made famous through theBokujo Monogatari series’ prolific 18-year history. Developed by a veteran Bokujo team and headed by acclaimed producer Yoshifumi Hashimoto, the game retains the series’ signature style while adapting and strengthening its offerings through the formation of this new IP. Newcomers can now experience the satisfaction of a successful harvest more quickly with the new Seedling mode, characters and farms can be fully customized, and longtime fans can enjoy an enhanced variety of seeds, pets, and other ways to make their farms truly their own. 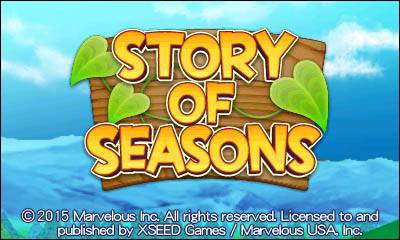 Developed in Japan by Marvelous Inc., STORY OF SEASONS is published in North America by XSEED Games, exclusively for Nintendo 3DS. The game is available in physical format at participating retailers and digitally in the Nintendo eShop for $39.99. This game has been rated “E10+” for Everyone ages 10 and up by the ESRB with the descriptors Alcohol Reference, Mild Suggestive Themes and Violent References. Rune Factory 4 is the latest installment in the critically acclaimed Bokujo Monogatari spin-off series, Rune Factory, which revolves around the same addictive life simulation and farming activities that its father franchise, now known asSTORY OF SEASONS, is famous for. The Rune Factory series, however, also incorporates classic action-RPG elements into the mix, all framed in a stunning fantasy setting. Taking place in the Kingdom of Norad, players must fill the shoes of a Prince or Princess and aid the people of a small, picturesque town named Selphia in achieving lasting peace and prosperity. Boasting countless items, crops, weapons and other pieces of equipment to find and grow, as well as a substantial story with richly developed characters, innumerable hours of enjoyment await within the game’s humble confines. 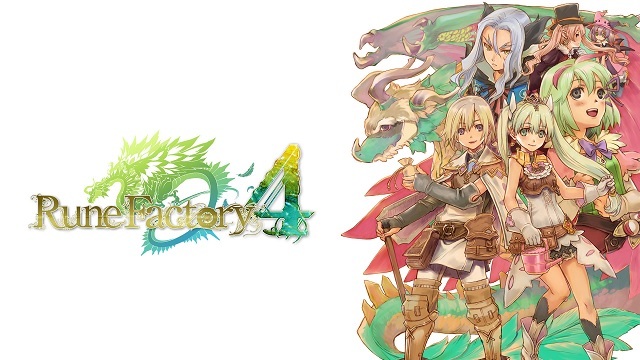 Rune Factory 4 is published in North America by XSEED Games exclusively for Nintendo 3DS. More information on STORY OF SEASONS can be found at www.storyofseasons.com, and more information on Rune Factory 4 can be found at www.runefactory4.com. For more information on XSEED Games products, including Return to PopoloCrois: A STORY OF SEASONS Fairytale, please visit www.xseedgames.com. Fans can also follow XSEED Games on Facebook at www.facebook.com/XSEEDGames and on Twitter at www.twitter.com/XSEEDGames.